TRULY WAY EXCEEDED MY EXPECTATIONS! I have cruised many many times but have not cruised Carnival for many many years, choosing instead the supposedly more upscale cruises on NCL, RCL, Celebrity. I chose this as I was the cruise planner for 3 of my family, 2 of which, had never cruised before. 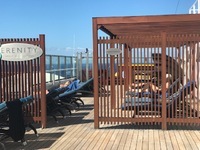 I needed to keep the price affordable for them, but also provide them with the best cruising experience with several ports of call, good and multiple free food options on the ship, and lots of activities on the ship. Spouse and I had not had the best experience on Carnival previously (though this was many many years ago) as far as customer experience, rowdiness on the ship, etc. However, this experience blew my concerns totally out of the water - pun intended! 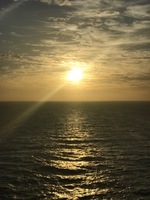 This was the absolute best cruise I have ever taken and I&apos;ve taken many! The ship Glory, though an older ship, is updated, clean and beautiful. Staff are constantly cleaning every aspect of the ship. As a health care professional, I appreciated their attention to infection control from the environment to the food prep and service. It is clear, in all aspects, that safety is first! The customer service was perfect - impeccable from every staff member we encountered, no matter what position - very impressive! All staff were friendly, attentive, helpful, ALWAYS! Food was excellent! Family loved the main dining room - with great and multiple food choices - and the entertainment every evening by the singing/dancing wait staff! There were also multiple free food options, other than the dining room, - also very good - and more free options than I&apos;ve seen on other cruise lines! Ship entertainment was phenomenal and by far, the best I have ever experienced on a cruise!!!! If someone did not have fun on this ship, they must be dead! So many options - from comedy shows, lido deck parties, production shows, game shows, movies, dancing, water park/slides, mini golf, plus the usual running/walking track, enrichment activities, gym, spa, casino, shopping, etc.. There was multiple live music venues always going at various locations on the ship -something for everyone - and all of the music was terrific! I also appreciated Carnival&apos;s support and fundraising for St. Judes. CARNIVAL LIVES UP TO ITS NAME AS THE FUN SHIP!!! 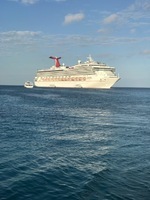 The Carnival excursions were also very good and well run (speaking from what excursions we took). COOKIE IS THE BEST ACTIVITY CRUISE DIRECTOR EVER!!! I love you Cookie! He is the best I&apos;ve every had the pleasure of experiencing!! His humor, and superior people and organization skills, truly made this cruise so memorable!! He is A+!! The guy never stops working! of the and he truly seems to love what he does. The ship appears to be very well run - especially in crowd control -considering there were almost 3000 passengers on board (and only slightly less staff). There were not long lines for dining, etc. 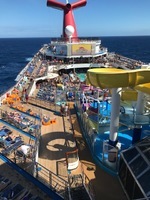 ; ship does not feel crowded, enough pool lounge chairs, etc. Embark and debark process were also the easiest, fastest, and smoothiest I&apos;ve ever seen in my many cruises! My only tiny complaint was regarding gym/spa. I would like to have seen more exercise classes offered, not just the few few yoga/pilates...for example, Zumba, Jazzercize-type classes, etc. Carnival - you definitely wowed me and I&apos;ll be back!!! Serenity area - adults only with cushioned chairs, bar, two spas = heaven! TRULY WAY EXCEEDED MY EXPECTATIONS! I have cruised many many times but have not cruised Carnival for many many years, choosing instead the supposedly more upscale cruises on NCL, RCL, Celebrity. I chose this as I was the cruise planner for 3 of my family, 2 of which, had never cruised before. I needed to keep the price affordable for them, but also provide them with the best cruising experience with several ports of call, good and multiple free food options on the ship, and lots of activities on the ship. Spouse and I had not had the best experience on Carnival previously (though this was many many years ago) as far as customer experience, rowdiness on the ship, etc. However, this experience blew my concerns totally out of the water - pun intended! This was the absolute best cruise I have ever taken and I&apos;ve taken many! The ship Glory, though an older ship, is updated, clean and beautiful. Staff are constantly cleaning every aspect of the ship. As a health care professional, I appreciated their attention to infection control from the environment to the food prep and service. It is clear, in all aspects, that safety is first! The customer service was perfect - impeccable from every staff member we encountered, no matter what position - very impressive! All staff were friendly, attentive, helpful, ALWAYS! Food was excellent! Family loved the main dining room - with great and multiple food choices - and the entertainment every evening by the singing/dancing wait staff! There were also multiple free food options, other than the dining room, - also very good - and more free options than I&apos;ve seen on other cruise lines! Ship entertainment was phenomenal and by far, the best I have ever experienced on a cruise!!!! If someone did not have fun on this ship, they must be dead! So many options - from comedy shows, lido deck parties, production shows, game shows, movies, dancing, water park/slides, mini golf, plus the usual running/walking track, enrichment activities, gym, spa, casino, shopping, etc.. There was multiple live music venues always going at various locations on the ship -something for everyone - and all of the music was terrific! I also appreciated Carnival&apos;s support and fundraising for St. Judes. CARNIVAL LIVES UP TO ITS NAME AS THE FUN SHIP!!! The Carnival excursions were also very good and well run (speaking from what excursions we took). COOKIE IS THE BEST ACTIVITY CRUISE DIRECTOR EVER!!! I love you Cookie! He is the best I&apos;ve every had the pleasure of experiencing!! His humor, and superior people and organization skills, truly made this cruise so memorable!! He is A+!! The guy never stops working! of the and he truly seems to love what he does. The ship appears to be very well run - especially in crowd control -considering there were almost 3000 passengers on board (and only slightly less staff). There were not long lines for dining, etc. ; ship does not feel crowded, enough pool lounge chairs, etc. Embark and debark process were also the easiest, fastest, and smoothiest I&apos;ve ever seen in my many cruises! My only tiny complaint was regarding gym/spa. I would like to have seen more exercise classes offered, not just the few few yoga/pilates...for example, Zumba, Jazzercize-type classes, etc. Carnival - you definitely wowed me and I&apos;ll be back!!! Nice cabin - balcony view was unobstructed. I chose this for its mid-ship location both from deck perspective (middle of ship) and mid from aft/forward perspective. This was to ease possibility of sea sickness (two travelers had never been cruising before) and also for ease of access to everything. It was a perfect location. Our steward, Budi, was phenomenal - thank you Budi!! We had 4 in our balcony cabin with two twin beds, one sofa bed, and one pull down bed. With 4 ladies, yes...got a little cramped and messy at times...but we were only in the room to sleep! My bed (one of the twin beds) and pillows was surprisingly comfortable!! It was also very quiet in our hall! This cabin was a perfect choice! We did not take an excursion here. Belize is about 5 mile boat ride from where boat anchors in ocean so fairly long tender ride. Area where the ferry docks is a typical tourist area with vendors, shops, some restaurants/bars. Would recommend that one take an actual excursion if you really want to see what Belize is like. This was phenomenal...best part of our cruise. Cozumel was beautiful! First part of excursion was snorkeling over barrier reef; tour guides were extremely helpful and attentive and in the water with us to keep us safe. Beautiful fish, though not really that bountiful. Next was ride to the private beach where there were restaurant, shopping, etc. There was also many "toys" - large inflatable slides and such in the ocean - which was extremely fun! One could also use the floating devices, kayaks, etc. to play in the ocean. We all loved it! Only drawback was total excursion was only 4 hours - not enough time to snorkel, and play at the beach with the transportation time. The excursion guides were excellent! Did I mention open bar on both the catamaran and the beach?!!! 4-5 feet deep sandbar off Cayman Island - only place in the world where you can see, touch, and feed wild stingray. Fun for all - adults and kids alike! Beautiful island, beautiful beach, within walking distance from ship! Numerous restaurants/bars, shopping, hair braiding, etc.